The Black Ops 2 Gamepack for Titan One has 50 distinct MODS grouped into 12 classes, specially optimized for Call of Duty Black Ops 2. This Gamepack allows you to make up to 31,518,720 combinations of MODS. Player LED 1: Controller in regular mode, all MODS are disabled. Player LED 4: MODS are enabled. When rapid fire is enabled, you can turn virtually any semi automatic weapon into a fully automatic weapon. This creates a very unique advantage for players using semi automatic weapons in Call of Duty games. While rapid fire will not usually make a fully automatic gun shoot any faster, it can have positive side effects on fully automatic guns such as reducing recoil, helping players conserve ammunition and achieve more headshots. Jitter mode allows user to shoot single/burst fire weapons as fully automatic for ultimate firepower. When using any burst weapon, activating jitter mode decreases the time between bursts, making guns shoot faster. Fast Jitter uses a different button combination to archive a fast rate of fire. This mode is specially effective when using shotguns. Independent rapid fire, burst fire, and jitter on the left and right dual wield weapons. Dual independent is very similar to Akimbo except it lets you select whether to fire the left weapon, right weapon, or both at the same time. In Call of Duty, the soldier can arm himself with pistols in both hands in Akimbo mode. Firing both pistols means that the player must awkwardly pull both the left and right triggers. This can make aiming more difficult. When the Dual Easy feature is turned on, pulling the right trigger alone will fire both pistols using rapid fire, burst fire, or Jitter. Dual Easy with Scope Disable feature. Dual Easy will only be activated when fully press the fire button. Quick scope is widely used in Call of Duty games. The idea behind quick scope is to use a sniper rifle, scope IN and fire the shot as the gun scopes in. Perfecting the aiming and timing will allow you to become a one-man commando with your sniper rifle. To fire a quick scope shot, quickly TAP your scope button. The MOD will automatically scope in, take a shot, and scope out. Check the menu system instructions above for more information on how to adjust the timing in this mode. Auto Aim Zombie MOD is specially designed for the Call of Duty series Zombie Arcade mode and Modern Warfare 2 and 3 in campaign mode. Auto Aim allow you to auto-aim to the nearest Zombie while scoping your rifle. Any time you pull the left trigger to aim it will lock to the nearest Zombie. Fast Reload is a mode enabling a player to reload a weapon fast than normal. NOTE: Fast reload does NOT work on some shotguns or sniper rifles. Fast reload only works on guns that have a magazine or clip. It will not work on weapons that load rounds one at a time. There are several factors that affect fast reload including the perks you select. Perks such as Sleight of Hand will actually change the fast reload timing. Different weapons also have different fast reload settings. Reload a weapon fast than normal. If you are tired of constantly pressing the left thumbstick to make your character sprint, Easy Sprint is just what you have been looking for. NOTE: Easy Sprint MOD CAN be used with Sniper Breath and Quick Scope simultaneously. Turbo Melee significantly decreases the time the character has to wait between knife attacks. It can also be used to decrease the wait time between Riot Shield melee attacks. Once you have activated Turbo Melee, all you need to do to perform a melee attack is press your melee attack button. Get ready for knife kill sprees and easier kills with your riot shield! Semtex Grenade MUST be equiped! Turbo Knife optimized for Black Ops 2. Most users play their favorite Cal of Duty games using the default button layout but a lot of players do use optional button layout and switch their thumbstick positions. With the Button Layouts you can make any of the MODS on the Titan One work with your favorite button layout. With accelerometer aim assist, you can use the Six Axis PS3 controller to aim while scoping. This means you can move the controller to adjust the target position when scoped in. This MOD will not affect aiming with the right stick. It will only add an additional option to aim with. Each of the modes will add sensitivity with mode 1 being the least sensitive and mode 5 being the most sensitive. 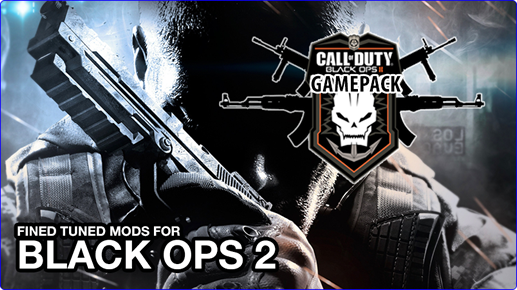 The Black Ops 2 Gamepack allows you choose and combine one MOD from each Class, being possible to have a total of 12 active MODS at the SAME TIME. This means you can make combinations such Burst Fire added to Rapid Fire, resulting in an exclusive "Automatic Burst Fire" MOD. The Automatic Burst Fire can be optimized by adjusting the number of bullets fired per burst as well as the time between bursts. For additional optimization, you can add the "Scope Enable" MOD, which will make the Automatic Burst Fire be activated only when the ADS scope is in use. With this combination, you can activate Rapid Fire by partially pressing the fire button and drop shot by fully pressing the fire button.